A magnitude 6.4 earthquake struck Sunday morning 551 kilometres northeast of Fairbanks. Alaska's North Slope was hit Sunday by the most powerful earthquake ever recorded in the region, the state's seismologist said. 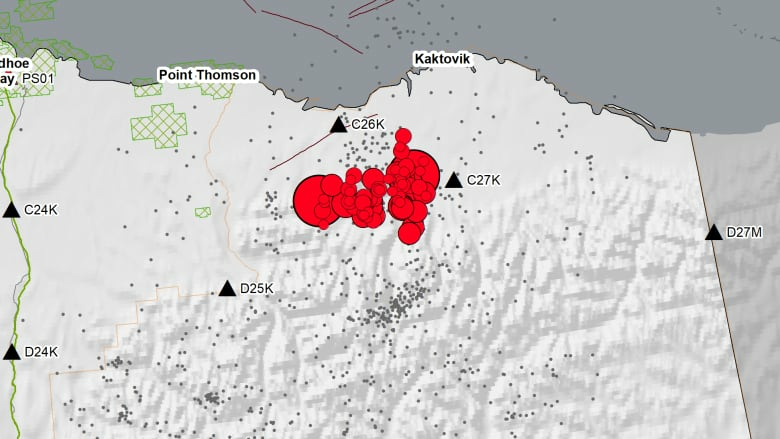 At 6:58 a.m. Sunday, the magnitude 6.4 earthquake struck an area 67 kilometres east of Kavik River Camp and 551 kilometres northeast of Fairbanks, the state's second-biggest city. The U.S. Geological Survey says the earthquake had a depth of about 9.9 kilometres. State seismologist Mike West told the Anchorage Daily News that the earthquake was the biggest recorded in the North Slope by a substantial amount. "This is a very significant event that will take us some time to understand," he told the Daily News. "That's why at 6.4 this changes how we think about the region," said West. "It's a little early to say how, but it's safe to say this earthquake will cause a re-evaluation of the seismic potential of that area." The Alaska Earthquake Center made a visualization of 30 minutes of ground motion data following the 6.4 earthquake, represented as a red star, including two aftershocks. Later on Sunday, another magnitude 6.1 earthquake hit at 1:15 p.m. near the city of Kaktovik on Alaska's North Slope, the U.S. Geological Survey said. The epicentre was 65 kilometres southwest of Kaktovik, which has about 290 people. The newspaper said that Alyeska Pipeline said the earthquake did not damage the trans-Alaska pipeline. The company says in a tweet that "there are no operational concerns" related to the earthquake, but the pipeline will be inspected. The Alaska Earthquake Center said the earthquakes were felt across the eastern part of the state's North Slope Borough and as far south as metro Fairbanks. The center added that there are no reports of damage.